Digital surrogates from Senate Committee on the Library Annual Reports, includes digitized annual reports of the University Senate Committee on the Library, including narrative reports; tables and lists relating to the Library's growth; departmental fund allocations and book fund assignments; notable acquisitions and gifts; cataloging; serials; public services; use of the Library and circulation; reference work; lost materials; medical library; Chicago Undergraduate library; and personnel. Materials include minutes and reports of a special committee on Library Program (1931) and a report of the Subcommittee on a Bindery (April 8, 1931). Digitized material was created during a large-scale digitization project, conducted by the University Library in 2007. 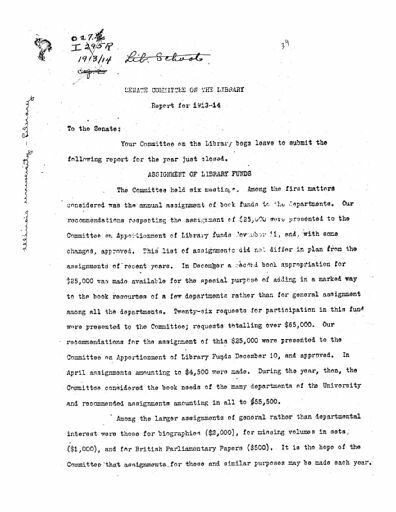 The Senate Committee on the Library Annual Reports (Digital Surrogates), 1913-1995 are managed by the University of Illinois Archives and do not feature precise descriptive information for each item. Discover their contents by browsing the folders and files. For more information, contact an archivist at illiarch@illinois.edu.